Life on a Cliff is the sequel to the highly successful Cliff Walking by author Stephen Russell Payne. Focusing in deep detail on the highly emotional and difficult life of recovering addict Kate Johnson, the sequel continues her journey with her artistic son, Stringer, and her newfound relationship with the seascape artist, Francis Monroe. Set once again in the dramatic coastal clime of Maine, this novel makes it clear that even when the dramas of life are over, the scars still remain. Kate can’t help but be damaged by the life she once had with her abusive husband, Leland, and even in newfound happiness, her own past threatens to inhibit positive change. Stephen Russell Payne certainly knows how to write an emotional tour de force with humanity at its heart. Despite not having read Cliff Walking, I was immediately drawn into Kate’s character and able to understand her motivations, fears and past demons. I felt great sympathy for Francis in trying to understand her, but ultimately this is Kate’s tale of going through the psychological motions of a difficult event when that event is finally laid to rest. Written as a ‘calm after the storm’ drama, Stephen Russell Payne’s prose is smooth and effective, his dialogue realistic and his sense of plot and timing truly devastating in places. This is a journey that drama seekers will certainly enjoy, even if it pains them at times. Overall, Life on a Cliff taps into a deep emotional humanity that is sure to touch readers of all walks of life. 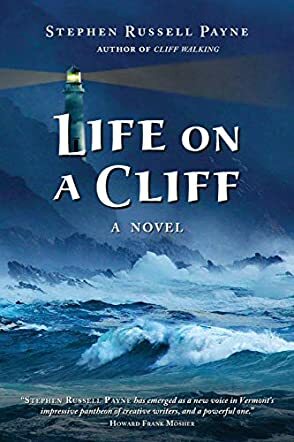 Life on a Cliff by Stephen Russell Payne is the sequel to the award-winning novel, Cliff Walking. It portrays the lives of a family living in a provincial town on the rugged coast of Maine. Francis Monroe, who is a famous seascape artist, is living with Kate Johnson and her son, Stringer. Both mother and son fled an abusive relationship and, with the help of Francis, came through a grueling trial. However, while Francis is keen to put all this behind them and move on with their relationship, Kate has many demons taunting her from the past. She struggles with addiction, which threatens the stability of her present life. Stringer also has his problems but shows great maturity and artistic flair. He gets on well with Francis and hopes that his mother will not sabotage the good life they have found with this man. The atmospheric setting of this novel creates a perfect backdrop to the gripping story line that unfolds in Life on a Cliff. Stephen Russell Payne writes an original and honest narrative about the legacies of previous relationships and life experiences. There are a number of complex characters in this book and they are dealt with in a poignant and evocative way. This book is also a coming of age drama with Stringer and his damaged girlfriend providing a brilliant parallel story line alongside Francis and Kate. I loved all four of them despite, or possibly because of, their problems. I desperately wanted it all to work out for them. Thrilling and exciting, this book had me hooked from the very beginning until the very end. Life on a Cliff by Stephen Russell Payne is the follow-up to the author’s first novel, Cliff Walking. Kate and her son, Stringer, have moved to Maine from California in an attempt to leave their turbulent and life-changing past behind and start a new life with Francis Monroe, a renowned artist. Francis is in love with Kate, but she struggles to leave behind the terrors of her past, which seem to be chasing her. Stringer struggles at first being away from California, but when he meets Sam, another troubled soul, his outlook changes. However, ghosts from the past are chasing Kate and Stringer and both have to fight for their very lives in order to have a future. Life on a Cliff is exactly that; a story where each character stands on a cliff edge of life and the forces around them can either push them over, or drag them back to safety. Kate is a feisty character, molded by a seedy life and cruel people, and she finds it hard to accept the calm and stable life Francis offers her. But then it takes tragedy and fear for her to realize the things that are really important in her life. Sam is lost, refusing to trust anyone after a dreadful childhood, until she meets Stringer. The author, Stephen Russell Payne, has carefully woven in the history of Kate and Stringer to move this story forward, so that the reader is clear on what has happened previously and is able to follow the lives of the troubled characters in this gripping and fast-paced story. Kate, Stringer and Sam are appealing characters despite their problems, held together by the steady influence of artist Francis. Well written, definitely an edge of the seat read as the story reels from one crisis and life threatening situation to another, this is certainly an entertaining read and one to be recommended for lovers of thrilling, fast moving adventures. Well deserving of five stars. Couldn't agree more with these 5 star reviews. Paynes novels are like good old fashioned novels with a sharp modern flair. Where has this great author been? !